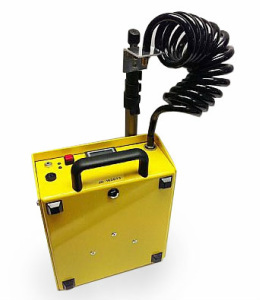 A robust asbestos static air sampling pump with a nominal flow rate of 16 L/min (Litres Per Min) adjustable from 8-17 L/min using the control pot on the front panel, with run times of 3 hours minimum. The JD16T comes equipped with a display timer and a mast of your choice. Options available are for a telescopic mast or a quick release push fitted mast. Our air sampling pumps are designed by experienced field staff to withstand the rigours of site work, particularly in the asbestos removal industry. They are made from epoxy coated aluminium and as a result, are strong, rigid and rustproof. The flow is adjusted electronically and the pumps are designed to provide a constant vacuum resulting in steady flow rates over the course of a sampling period. Accuracy is typical within + or - 3% of set flow rates.